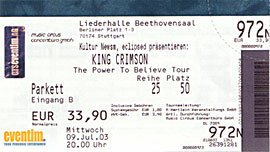 For starters, a King Crimson live show is always apt to leave quite a few questions unanswered. For example: why on earth do the schedule just a single gig in Germany, which is no doubt one of their biggest markets? And why is it that they let their audience wait for them to come out for more than one hour? I suspect they just have the guts to. However, on one occasion during that hour, Mr. Robert Fripp appeared on stage. And when I say 'appear', I should add that he was actually in a constant state of disappearing: no light would ever touch his figure during the entire show. Anyway, Mr Fripp came out, was instantly engulfed in applause, but didn't seem to take notice. He sat down with his guitar, and what followed - a stretched-out carpet of floating sounds - was again posing a question: did Fripp actually play or was he just tuning his instrument? Well, I understand he did play, and the music is aptly referred to as Soundscape. After a pause, the lights dimmed and the whole band lined up to launch into The Power To Believe I, which lead directly to the musical onslaught of Level Five. The set that followed included all that a King Crimson aficionado craves for: the stomping ProzaKc Blues, the extraordinarily brilliant The ConstruKction Of Light, the frightening Facts of Life, the multi-layered Elektrik, the comparatively calm The Power To Believe II, the catchy Dinosaur, the soaring One Time, the heavy Happy With What You Have To Be Happy With, the swelling Dangerous Curves, and the knotty Larks' Tongues In Aspic Part IV/Coda. All of the tracks were culled from Crimson's latest three releases, but as a matter of fact, one does not really miss older material. As for the musicians, little is left to be said. Each of them clearly is a top-notch craftsman and artist, contributing to the King Crimson experience with a precision that leaves your mouth open. Trey Gunn's work on his Warr guitar is nothing short of magic. Mastelotto's drumming marries power and subtlety in an astonishing way. Adrian Belew's guitar play left nothing to be desired either, while his huge stature and his open attitude made him a worthwhile centre of attention. The control, however, lay with the man in the shadow. Mr Robert Fripp kept leading his unobtrusive stage life, and to figure out whether he or Belew was playing the lead at a given time proved to be an enjoyable task throughout the show. His silhouette sometimes revealed the most frantic playing. At the end of the main set, when Belew & Co. enjoyed applause and approval, Fripp withdrew to the back of his side of the stage. His hands folded in his lap, he stood there waiting in the dark - and after a while, left. But naturally, as the audience demanded more, the band came back to perform Deception of the Thrush, which was followed by Elephant Talk, a track that I personally adore. Then Robert Fripp, apparently encouraged by the thundering applause, surprised his band by not leaving the stage but returning to his stool once again, thus signalling that yet another encore was due - a terrific rendition of Red. And although some may not believe it- at gig's end Robert Fripp approached the front of the stage, smiled and applauded to the audience. Wonders never cease. Unlike other 'dinosaur bands', King Crimson have always managed to make their output sound fresh and contemporary. At the same time, it was always different enough from the rest to appeal to the critics, it appeared to be sophisticated enough to be associated with the idea of 'art'. The masterful manners and eccentric attitudes of Crimson's core figure Fripp did the rest to solidify King Crimson as a quality brand name in music. And it is perhaps this awe-inspiring background which, in a live setting, dwarfs the actual concept of just a few musicians playing their stuff. The experience cannot adequately be put down in words, and as a consequence, the disadvantage of this review reveals itself: it's only talk.